jimmy's cocktail hour: Best Issue Yet. 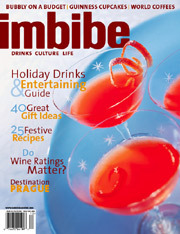 The latest Imbibe Magazine is out, and looks to be the best issue yet. If you don't have a subscription yet, head over to their website and sign-up. Highlights of this issue include a Holiday Gift Guide, Doc Cocktail's column, A profile of San Francisco's incredible Alberta Straub (from the Orbit Room), and tons of killer seasonal and holiday recipes. This is a great looking book. Great job Imbibe.